Munich - Mario Mandzukic could scarcely have got off to a better start with Bayern Munich, bagging a goal in each of their two opening league wins. After Sunday's thumping home victory over VfB Stuttgart, the Croatian forward spoke with bundesliga.com about the record champions' early-season form - and the arrival of another big name in the Bavarian capital. Question: Mario Mandzukic, 6-1 against Stuttgart - that was a clear win, but it did not look like it would be to begin with, did it? Mario Mandzukic: Stuttgart started the game well and we didn't. We only managed to play the way we wanted later on in the match, and then we did a good job. Question: Your second game of the season and your second goal - but Stuttgart did not really make it difficult for you, did they? Mandzukic: No, my goal was pretty straightforward. But scoring's not as important for me as that we play well and win games. The three points are more important than my goal. Question: Can you keep scoring in every game? Mandzukic: I'm happy to be playing and when I go to training - I'm just happy to be with Bayern and want things to carry on the same way. Question: Six goals for Bayern in the second game of the season - is that an early warning shot to the rest of the competition? Mandzukic: Without a doubt it's good for us and also for our self-confidence. And it shows the other teams who will be coming to the Allianz Arena that it's going to be tough for them to leave it with three points in the bag. 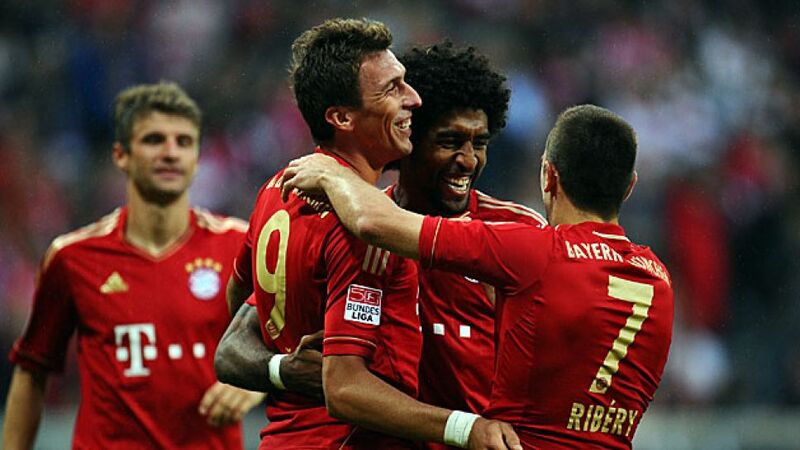 Mandzukic: It's great that it's not only the strikers scoring the goals. I hope our midfielders can keep chipping in with a few. Question: Javi Martinez was with you for the first time before a game - what kind of a character is he? Mandzukic: He comes up to talk to you because he wants to learn quickly. He's communicative and very friendly. Question: How do you communicate with each other? Mandzukic: He speaks very good English, so we talk in English. Question: How does it feel at the moment to look at the league table? Mandzukic: It's very nice, but the most important thing is where we are at the end of the season. But of course, we're really enjoying it all as a team and there's a fantastic atmosphere within the camp. At the moment, everything is going well - let's just hope it stays this way. Jessica Pulter reporting from the Allianz Arena.